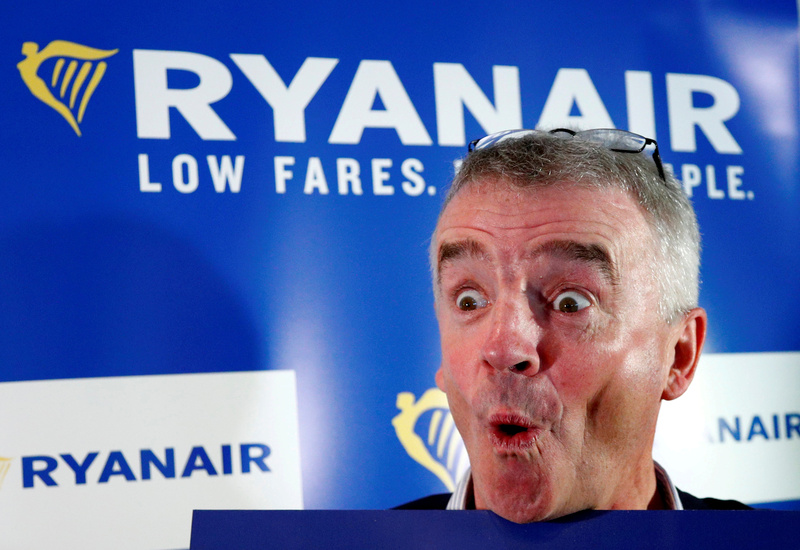 Ryanair CEO Michael O'Leary poses after a news conference in Machelen near Brussels, Belgium October 9, 2018. Ryanair Chief Executive Michael O’Leary has been awarded options over 10 million shares which could be worth almost 100 million euros ($113 million) if he doubles the airline’s profitability to 2 billion euros or increases the share price to 21 euros per share. The budget airline said on Feb. 8 O’Leary had been granted the option of buying 10 million shares at 11.12 euros per share if he meets either target. The airline is forecast to earn a net profit of between 1 billion and 1.1 billion euros in the year to March 2019. The airline said it has also offered each of its 11 non-executive directors options on 50,000 shares on the same terms. Ryanair shares were trading at 11.55 euros by 0900 GMT on Feb. 15.